This pillowy cotton cheesecake is often requested by my family and friends for social gatherings. 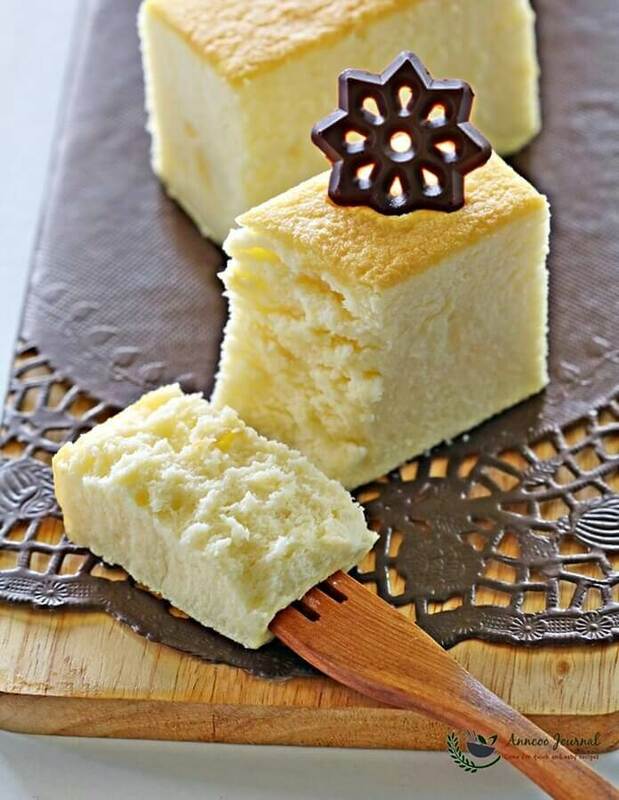 It is a very light fragrant cake that just melts in the mouth, and is always the first one to go on the table. Actually, I’ve tweaked this recipe a little this time by reducing the amount of milk (from 265ml to 250ml) and using 6 large eggs instead of 7, as some of my friends find that the old recipe was a little too moist. In fact I love both recipes 😀 Store this cheesecake in an airtight container and it can be chilled in the fridge for 5 days. Light boil milk and butter together at medium heat, lower heat add in cheese cream~use hand whisk to stir cheese cream till smooth. Sift in plain flour and corn flour mix well. Lastly add in egg yolks,one at a time. lemon juice and vanilla extract, mix cream cheese mixture till thick and transfer to large bowl, leave to cool. In a clean mixing bowl whisk egg whites, cream of tartar till foamy Add sugar in batches and whisk to peak form (that is the form peaks with tips stand straight when the beaters are lifted). Lower the speed of the cake mixer and gradually pour the cheese mixture into the meringue. Then stop machine and use a rubber spatula to fold the mixture well. 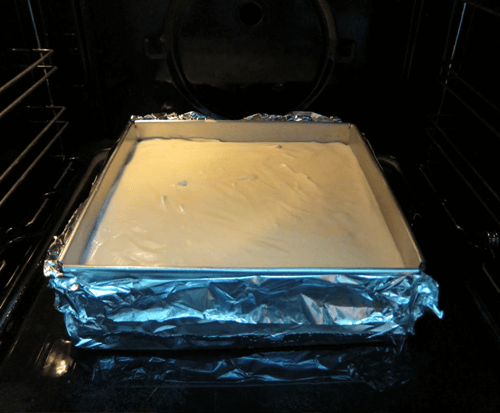 Pour cheese cream mixture to a lined 9″ square cake tin (9x9x3 inches) and place cake tin at the lowest rack in the oven. Steam bake (add room temp water) in preheated 150C for about 75 minutes. Store cheesecake in an airtight container and it can be chilled in the fridge for 5 days. Hi Ann, can 250ml dairy whipping cream to replace UTH fresh milk ? Thank you. Hi SiewCheng, sure you can use dairy whipping cream instead. May I know if i can use baking soda or baking powder in place of cream of tartar? Hi Mickey, you can use 1/8 tsp of salt in place of cream of tartar. Thank you very much, Ann! I’m not sure why but i don’t get emails from the response that you sent so that’s why i have to come into the post to see. Hi Mickey, you can click on the Notify of new replies to my comments on top on ‘Join the discussion’. Please let me know if it is still not working. Thank you! I always click on notify of new replies but today I got the email notification. Thank you! Is the ‘corn flour’ on the recipe, ‘corn starch’ or ‘corn meal’? Hi Yvonne, We usually called corn starch as corn flour in Singapore and Malaysia. Hi Ann, after finished baking the cake, I always notice there is a condensed layer at the bottom, surprisingly, this layer is always the same height as my water level. (I am using a non-spring form cake pan). Can you please advise? Hi Wayne, The water will be like keep heating the bottom of the cake when baking, that was why your cake got a condensed layer at the bottom after baked. Is better to add a little more room temp water to the pan after 30 minutes of baking. 1.Do u mix the flour in while the milk liquid still sit on burning stove? That mean cooking the flour in hot milk liquid? 2. Do u also add in yolks in hot flour mixture over the stove while the fire is still on? Yes, mix the flour and yolks under low heat. Anyway, you can move the pot away from the stove if the milk is too hot and stir in the flour and yolks, then put it back on the stove to stir the mixture well. What should the flour and egg mixture consistency be like? Do I stir until it is cook through? Any time estimate? Just mix the egg mixture to thick and leave the stove. Sorry to jump in here. I made this last night but the cake turned out very dense because I took a long time to mix in the meringue as my cheese mixture turned out lumpy and wayyyy too thick to mix. It looked like a giant scrambled egg mixture. Is that how it’s supposed to look? Or should it be a smooth thick liquid? Thank you! Hi Kee, You have over whisked the meringue to too dry and that was the reason why you got a hard time mixing it into the cheese mixture. Just whisk until he tip of the peak formed by lifting the whip droops over. Oh, thanks for the tip! I keep thinking it is the cheese mixture that went wrong because the yolks cooked through and became scrambled egg. Yes, I whipped the meringue till “stiff peaks” instead of “soft peaks”. Seems like I’m supposed to stop whipping it till “soft peaks” then. 1.Why is my cake crumbly on top ?not like the photo shown having a Neat cut. 2.And when cut the top will fall into pieces and the whole knife come out sticky with cake. Thus I cannot cut a nice neat cake.? 3. Can I add green tea to this cake? I use 130degreec n steam bake with hot boiling water for almost 2 hours . B4 2 hours while testing cake for doneness,stick always comes out sticky with batter that is why I have to bake for 2 hours. 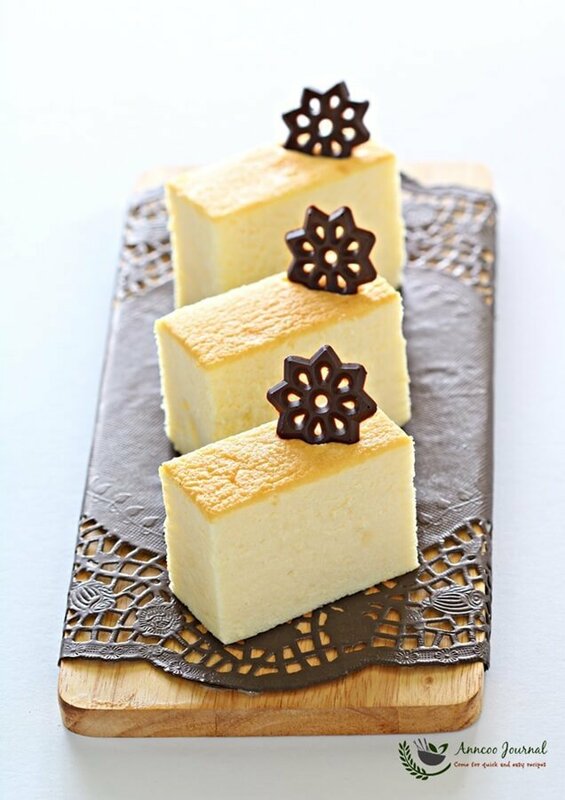 Cheesecake is a soft, moist and tender is not a dense cake. Never test the cake with a skewer. (please note: I didn’t mention to test the cake with a skewer). You should gently shake the cake pan and the center of the cheesecake should jiggle just slightly, then it is done. The cake will set better after chilling before cutting. To me, 130 deg temp is too low. I’ll add a step by step pics in this post later after my holidays. Yes， you can use cake flour. wow, looks delicious . would you believe it I have always stayed clear from making cheese cakes, this one looks easy enough. 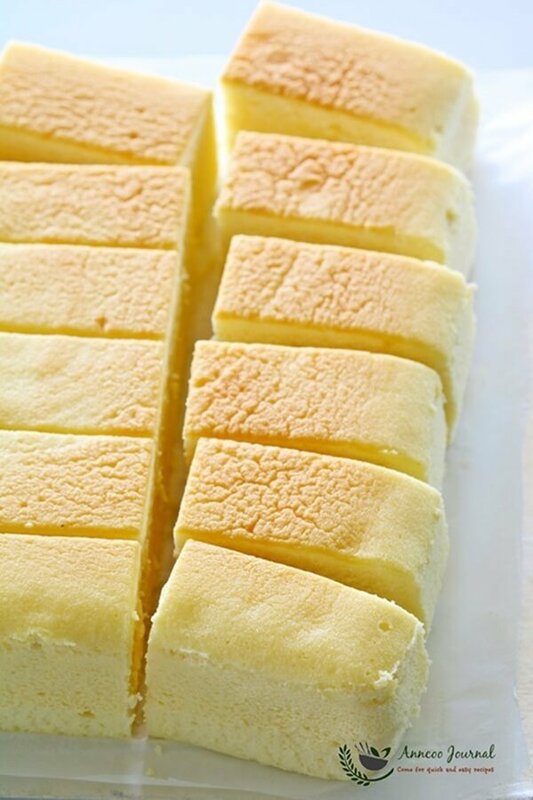 Looks super tender and soft…an excellent cheesecake recipe. How do you steam bake? I live in Switzerland and not sure how that’s done? Would love to try this recipe out tonight! Thanks for sharing! Can we use fresh milk instead? Sure you can use fresh milk or even low fat milk.